$3,870.00 Where does this come from? Strike Fighter Squadron 34 (VFA-34), aka “The Blue Blasters”, are a U.S. Navy Squadron that has been in continual service since 1948. 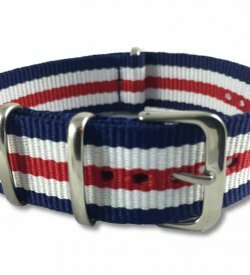 Named during WW2 for their blue tail colors and nuclear weapon capabilities, this group has been instrumental in military engagements across the globe: from World War II to the Iraq War. 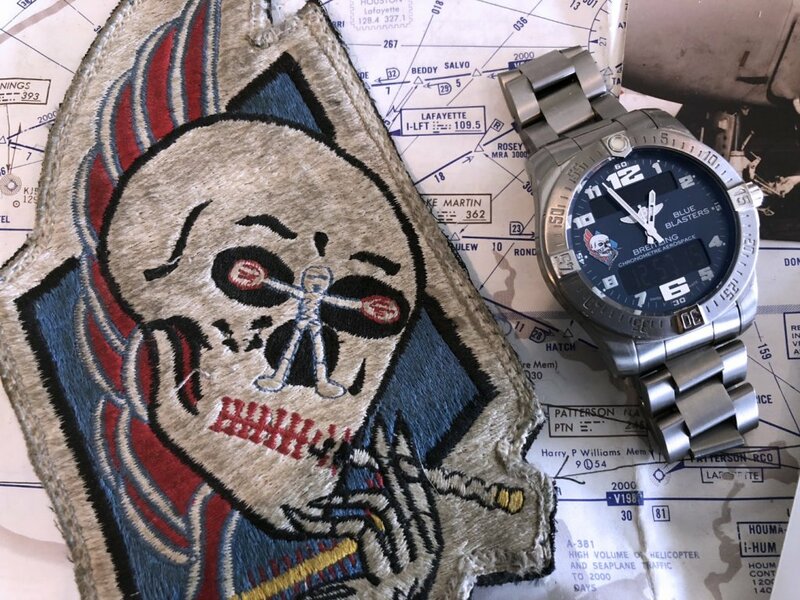 Their iconic insignia, a skull with a red mohawk smoking on a machine gun, was menacingly emblazoned on the group’s flight helmets and aircraft. 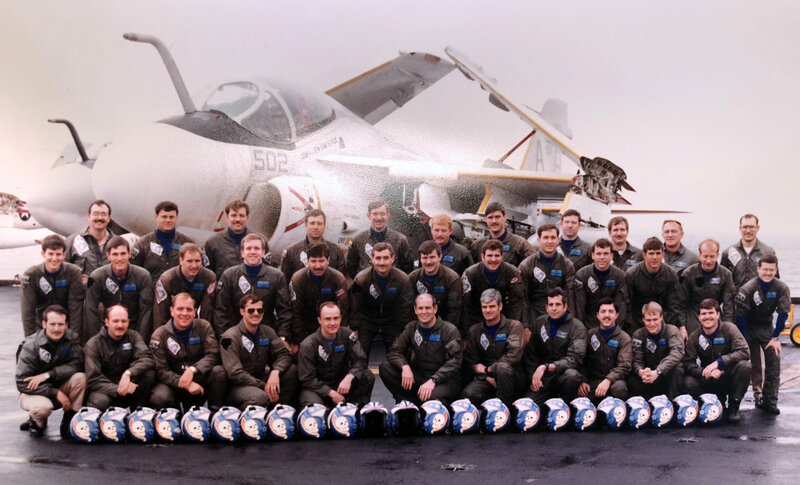 The model aircraft used in the squadron has evolved over time, but the “Blue Blasters” are best known for their A6 Intruders, a highly capable two-seat attack aircraft designed for dropping ordinance and being deployed from naval carriers. My father, Lt. Jan Johnson (also known as “The Swede”), served in the group from 1980 until 1984 as an A6 Intruder Pilot and LSO (Landing Signal Officer). As an amusing aside, I asked my father why they called him “The Swede” when he was actually German and Norwegian, his response: “It’s the military, they pick your name and you don’t really get a choice”. 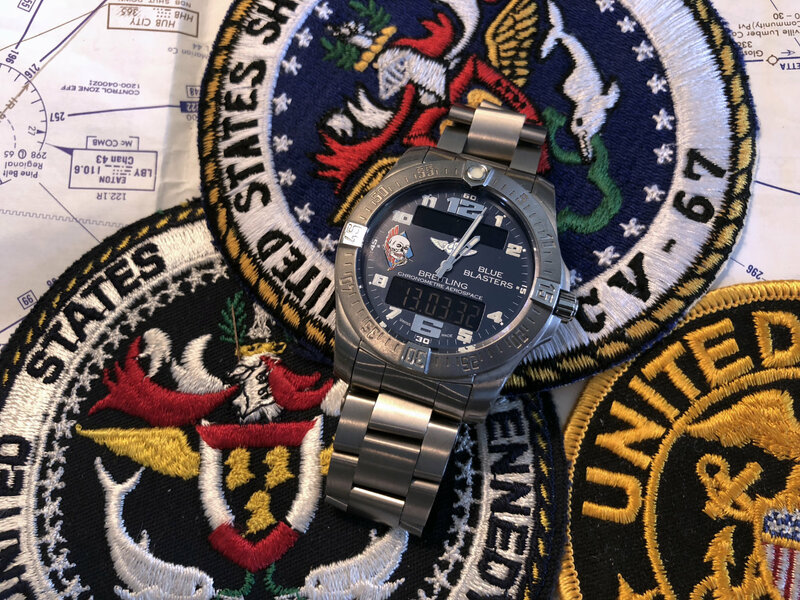 As a young commissioned officer making around $20k per year, my father certainly couldn’t afford a Breitling watch at this point in his life. 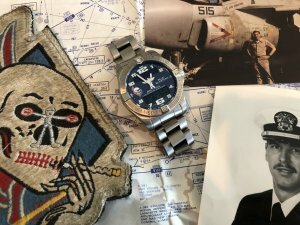 In fact, most pictures I’ve found of him during the period he is wearing a classic black Casio Databank – which was the “coolest watch he’d ever seen” at the time. I’m guessing using the small buttons on the calculator was a bit challenging while piloting an aircraft at 600 mph, but this cheap little Casio was a perfectly capable co-pilot. Just last year, Breitling reached out to members of the Squadron to see if there was enough interest to produce a limited edition “Blue Blasters” version of the Aerospace Evo. 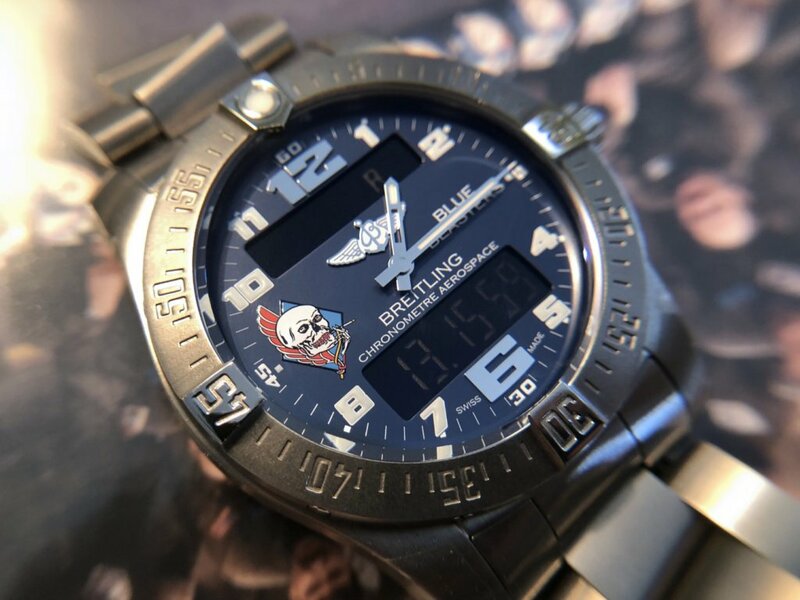 From time to time, Breitling does this for U.S. Military veterans to help commemorate various squadrons and combat groups. 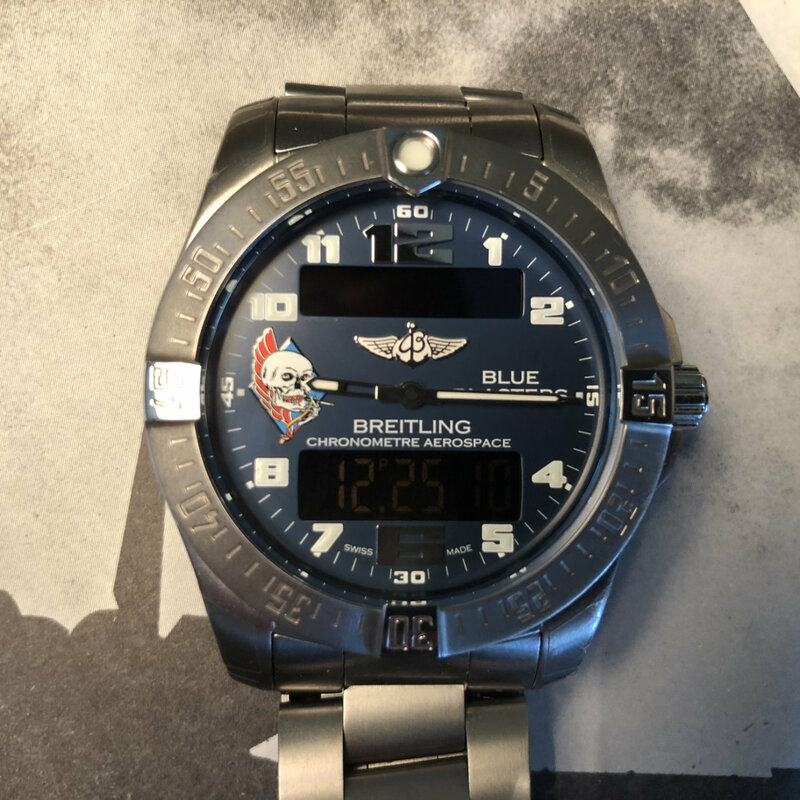 Of course, ex-members of the “Blue Blasters” jumped at the opportunity, and Breitling delivered 23 copies of this very special limited edition watch, including the one my father now owns and has graciously lent to me for this review. 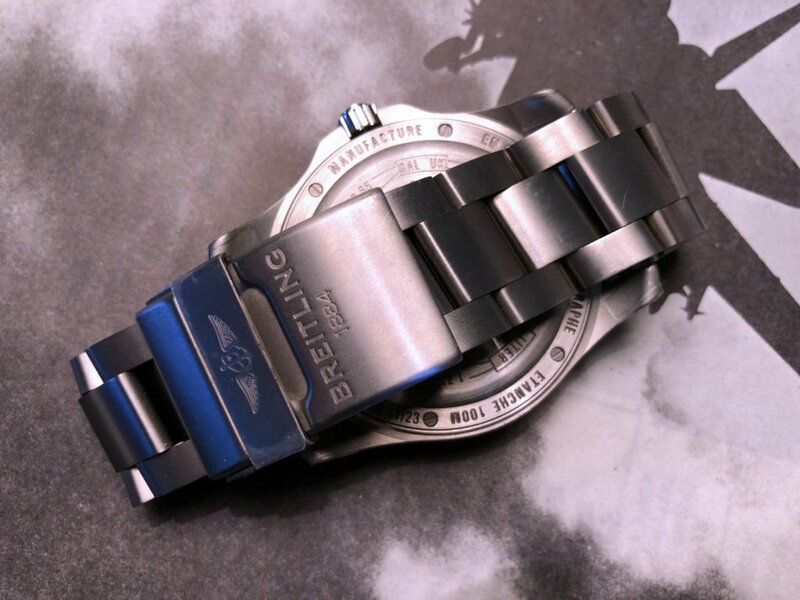 The Breitling Aerospace Evo is a modern watch through and through. 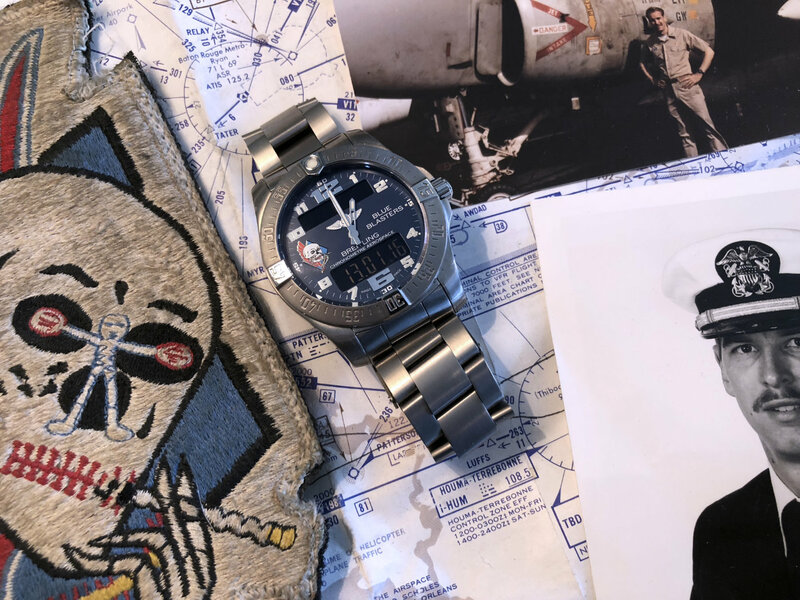 First launched in 1985, the Aerospace Evo retains many of the design elements of the 80’s style introductory model – dual digital display within an analog dial, a feather-light matte titanium case and bracelet, and a faceted unidirectional bezel. 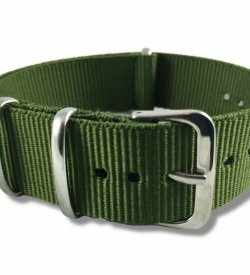 For fans of utilitarian military-issued watches, this one might be a bit too much. 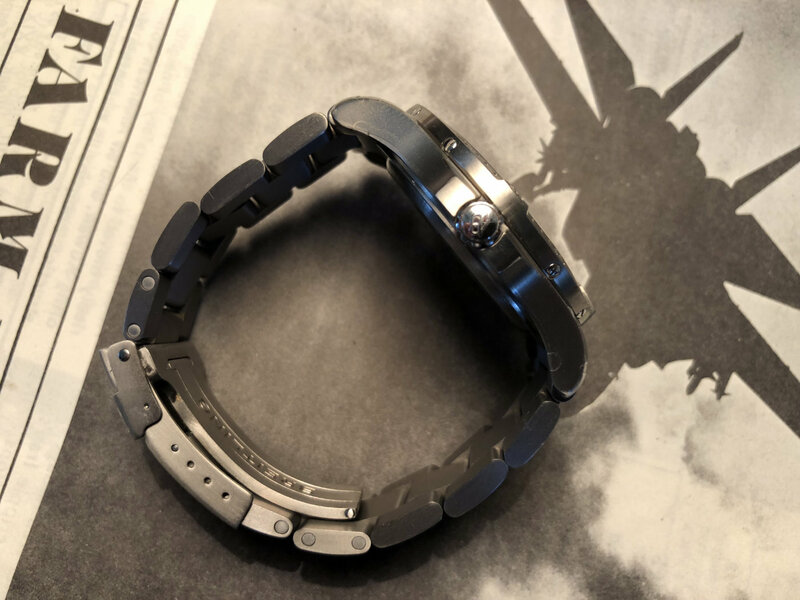 However, the design itself is rather iconic to the brand, so if you’re into the Breitling aesthetic pre-Georges Kern, there are definitely things here you will like. 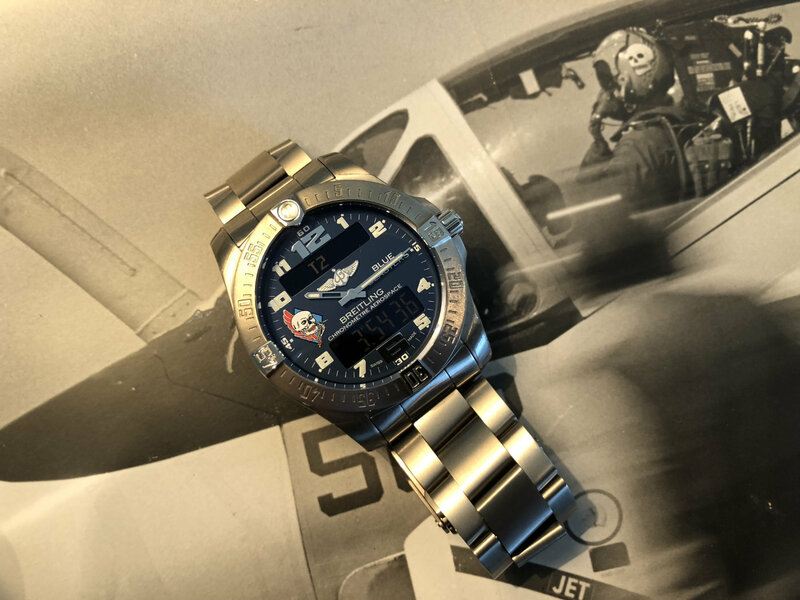 The newest iteration of the Aerospace Evo 43mm dial has large reflective numerals at 3, 6, 9 and 12, and on the military special editions the 9 is replaced by the military emblem of the squadron. The other non-reflective numerals on the dial are painted with lume. 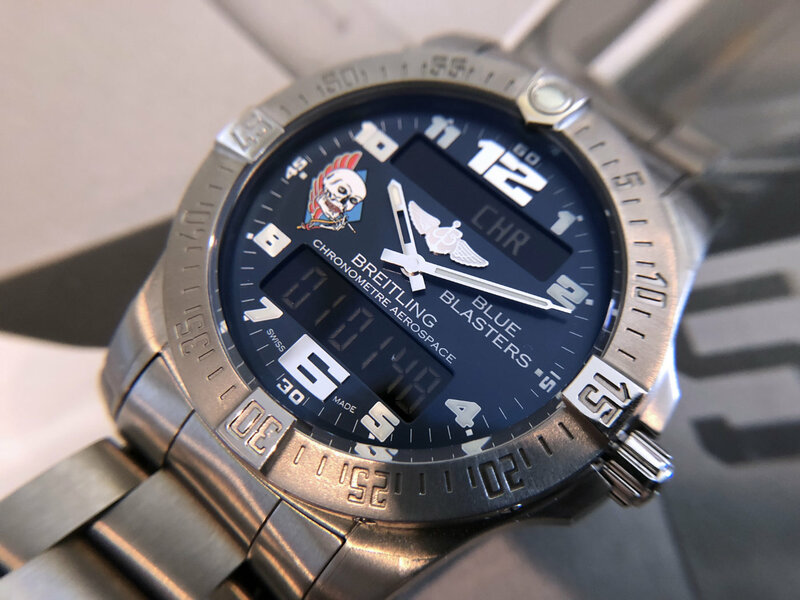 Dual negative digital displays are controlled via the crown, and host a wide variety of flight related functions, including dual time, an alarm, stopwatch and a digital chronograph. It wears a lot smaller than the 43mm specs would suggest. A 11mm thickness combined with a total weight of less than 3.5 ounces make this watch completely disappear on the wrist. The crown is rather small, considering its central importance to operating the various functions on the watch, but it works well enough. The crown has only two positions, but almost all functions are activated or configured through a variety of slow or fast twirls of the crown in either direction. Pressing the crown activates the various timing functions in the stopwatch and timer mode. It can be a bit overwhelming at first, especially when setting the time, because it’s not at all like setting a mechanical watch. Instead of simply turning the crown until the time is set, you must turn it at different speeds to set the hour and minute hands separately, and then synchronize the seconds through the digital display. Once set though, you likely won’t have to mess with it for years. A strange quirk here is that the quartz movement is not programmed to be a perpetual calendar, meaning the movement will need to be adjusted manually to account for leap years. 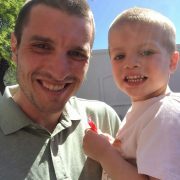 A minor inconvenience, but something worth considering. 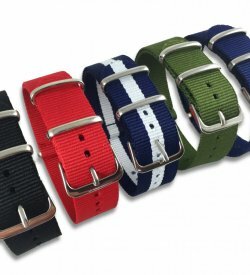 The bracelet is a matching matte titanium, and features a unique diagonal link construction that makes the bracelet appear that it is moving at velocity. 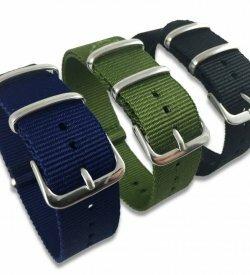 It’s worth noting that consumer versions of the Evo can be purchased with a calfskin leather, alligator leather, or rubber Pro Diver III strap. 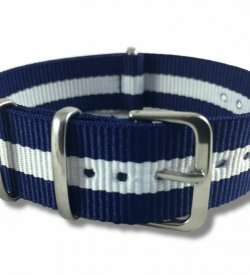 The rubber strap would be a great combination for a do-everything summer watch, however I would be a little wary of taking it in the water. Even though it is technically rated to a depth of 100M, the lack of screw-down crown makes me a bit nervous to submerse it completely. The hands are extremely thin metallic batons with Superluminova paint on the inside. The dial lacks a moving seconds hand, instead displaying the seconds on the bottom digital display. 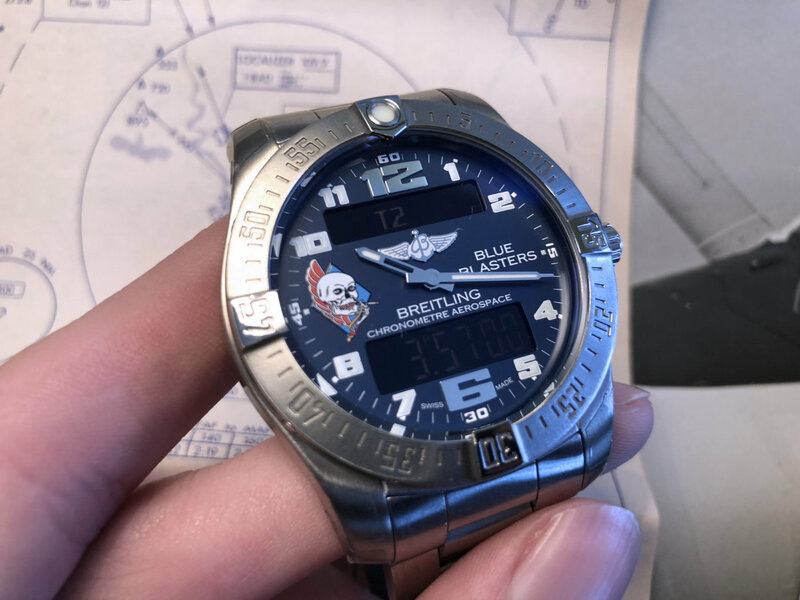 The bezel has four raised “tags” on each of the cardinal directions – I’m not personally a fan of the design here, but it does make it easier to grab and operate. It’s a design element you’ll see across the Breitling professional range, including watches like the Avenger, Colt, and Chronomat. The caseback on the Aerospace is quite interesting and potentially useful for actual pilots. 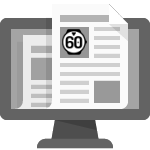 It is engraved with a circular conversion scale for converting fuel units between gallons, liters, pounds and kilograms. Although this type of information is probably handled by on-board flight computers, it’s an interesting anachronism at the very least and is very pleasing to the eye. 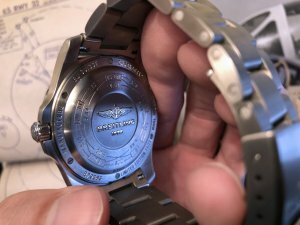 Inside the Breitling Evo Aerospace is Breitling’s in-house “SuperQuartz” movement known as the Caliber 79, and for accuracy freaks it’s quite an impressive module. 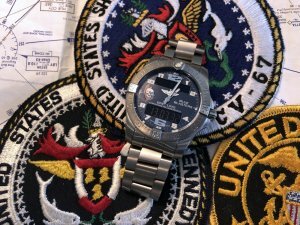 Not many quartz movements are COSC certified, but this does have that distinction. It should be noted that COSC certification for Quartz movements is much stricter than the mechanical standards. 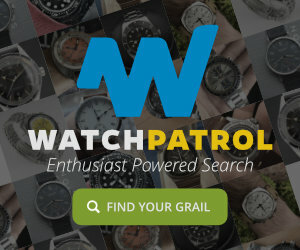 Losing only +/- 15 seconds per year, this is about as accurate as you can get with a Quartz movement that doesn’t have an atomic radio sync feature. How does it achieve these levels of accuracy? For one, this movement features a thermo-compensating technology that automatically adjusts the calibration of the regulator depending on the temperature of the movement. According to Breitling, the Caliber 79 is ten times more accurate than your run-of-the-mill quartz movement. For horology geeks, this in-house quartz movement might be enough to justify the luxury price tag. For most professionals however, a run of the mill quartz movement (like the Casio Databank) is quite accurate enough. 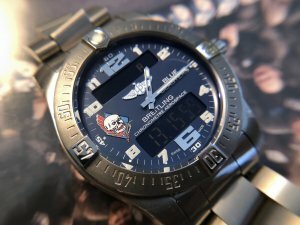 For a combo analog-digital watch with a host of flight related functions, the Breitling Evo Aerospace ticks a lot of boxes. But $3200+ for a quartz powered watch can be a bit much for many budding enthusiasts to swallow. 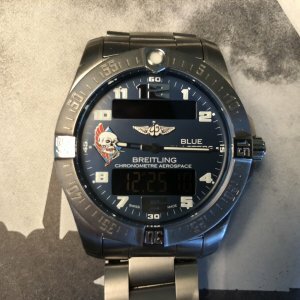 If you’re a fan of the analog-digital flight timer style, but don’t have the cash for the Breitling, there are a few other models you could consider. 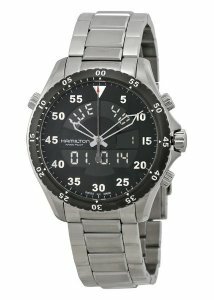 The Hamilton Flight Timer is a great choice, combining a dual digital display with a classic Flieger aesthetic. At less than $600, I think this would be my primary choice for the budget minded buyer who is still wants a high-quality watch. 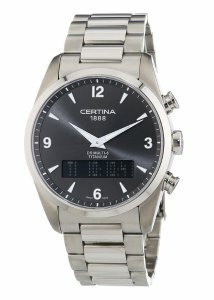 Around the same price range is the Certina Multi-8, although that watch only has a single LCD display. 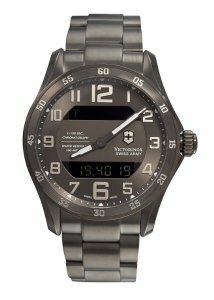 And finally, another alternative would be the Victorinox 241300 – although it’s a much larger watch at 45mm. Overall, these watches don’t have the same level of refinement and quality as the Breitling, but you would expect as much for a watch that costs nearly as much as a used Camry. 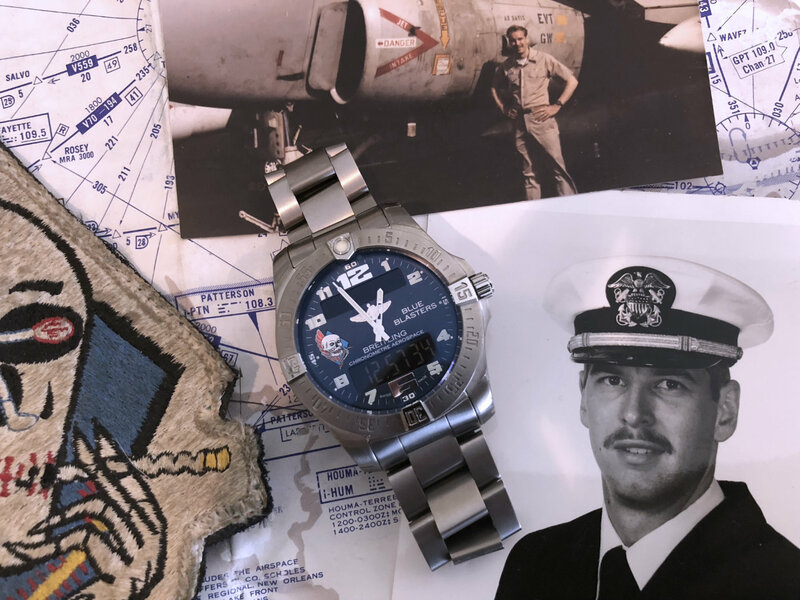 Although you won’t likely be able to get your hands on one of the 23 limited edition “Blue Blasters” Aerospaces, the civilian version of the watch is just as capable. It’s lightweight titanium construction and highly functional dual digital display make it a perfect watch for professional aviators. 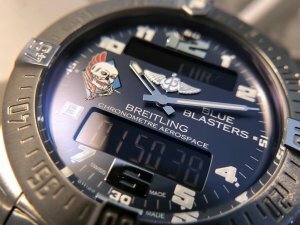 And fans of Breitling or aviation history will have a lot to enjoy with this piece too. It makes a fantastic everyday watch, and the Caliber 79 Superquartz is a battery powered movement that even the hautiest of horologists can stand behind. At around $3200, it’s quite a significant investment for most folks. And understandably, there is a lot of competition in this price-range from other popular brands like Omega and Tag Heuer. But it’s a unique watch, and those looking for a high-end analog/digital watch won’t likely find anything else quite like it in this tier. And hey, if you’re not ready to drop the coin on a Breitling, there is always the Casio Databank. I got one in 2003 when I was flying forest fire suppression aircraft. Got a pic somewhere with my arm hanging out the left window of a CL215 and it’s visible. Got a few dings on it in that environment but I always thought it added to its character. In late 2009 I moved to a mainly office job that still let me fly a little till retirement in 2016. Still got that Aerospace. 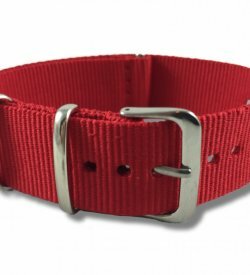 Wore it yesterday. Great watch.